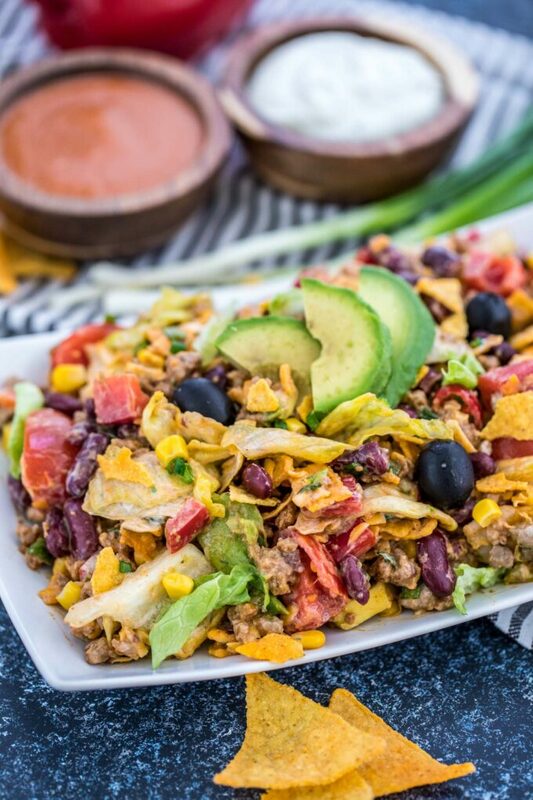 This Taco Salad Recipe is the easiest meal to make with just corn chips, beef, vegetables and served with a tangy homemade Catalina dressing. 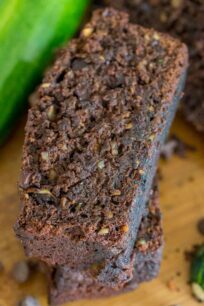 It’s crunchy and bursting with flavors that you will enjoy! 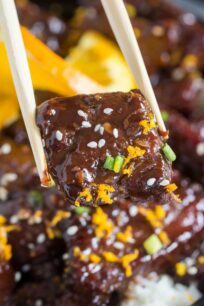 This recipe is super simple to make, especially if you don’t have too much time to spend around in the kitchen. Some other easy to make dishes are Pico de Gallo, Broccoli Salad, and Homemade Guacamole. 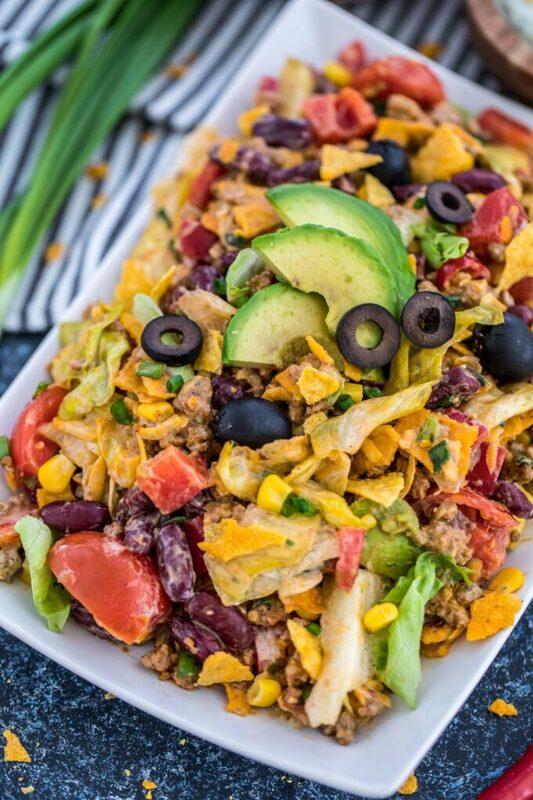 Taco Salad is originally a Mexican dish. It uses fresh and flavorful ingredients that you would expect in a Tex – Mex dish. With the combination of the juicy ground beef, crunchy bites of corn chips, vegetables, and Catalina dressing, you will surely enjoy this refreshing full meal! This is one of our go-to dishes when it comes to Mexican inspired recipes. 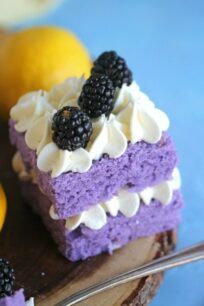 We love it because it is very simple to make with easy to find ingredients, and ready in a very short time. 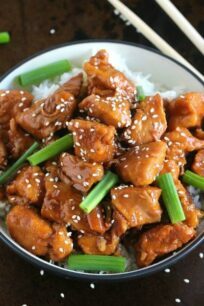 Also, it is very versatile as you can swap the meats or veggies with your favorite kind. Therefore, this is the perfect dish to please everyone in the family! On top of that, it is a stand-alone meal and full of proteins. 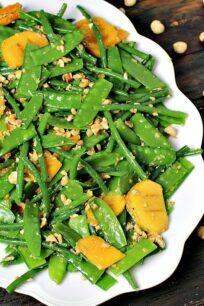 You can enjoy it for lunch or dinner, or store in the fridge and enjoy it the next day. How to make a taco salad? Making a taco salad is the easiest thing you could probably do in your kitchen. First, grab some ground beef, fry it in a pan and flavor it with store-bought taco seasoning. Alternatively, you can make your very own homemade taco seasoning by combining a few spices together. Then, make your bowls or shells, depending on how you would want to present your taco salad. Or simply build your salad in a large serving bowl. Lastly, make your creamy dressing, and then assemble. 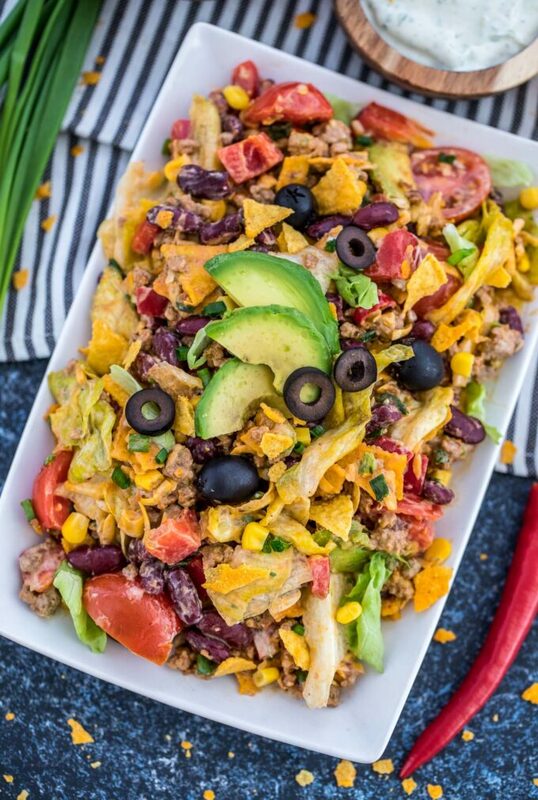 How to make taco salad bowls? Taco bowls are not hard to make, and it will impress your family and friends. Grab your oven proof bowls that can fit your tortilla wrap, spray or brush it with oil and place a tortilla inside, carefully folding it to make it look like a bowl. Bake until it is golden brown. How many calories in a taco salad? A taco salad typically contains about 141 calories for every 100 grams. 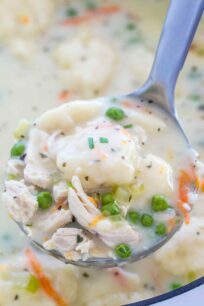 Because of the ingredients included in this recipe, you can make it as low calorie or as high calorie as you want. To reduce some calories, we suggest limiting the use of ground beef and the salad dressing. Also, use less cheese or go with the non-fat version. What goes in a taco salad? 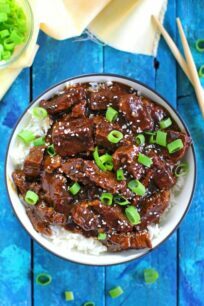 This dish is very versatile and you can basically load it with your favorite ingredients and toppings. You just need ground beef, taco seasoning, tortillas for the salad bowls or shells and salad greens. Also, you can use any vegetables you have on hand in your fridges such as various cheeses, sour cream, or salad dressing. How many carbs in a taco salad? There are about 12 grams of total carbohydrate for every 100 grams or about 16 grams in a cup of taco salad. If you want it with fewer carbs, reduce the tortilla chips, and use more of the protein such as veggies and meat. How to make a taco salad with Doritos? Who doesn’t like Doritos? We certainly do. 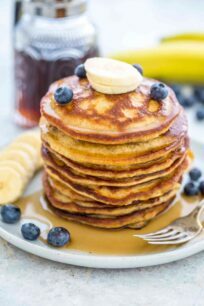 And to add it to this recipe is the best thing possible! It will give this salad a nice twist with familiar flavor and crunch. Just toss the Doritos with all the ingredients, and you are all set to go. How to make fried taco salad shells? Heat up a pan with about an inch of oil for frying. Once heated, place a tortilla in the pan, and leave it for about 30 seconds. Using kitchen tongs, pull one end of the tortilla and fold it halfway, holding it until the tortilla fries some more. Turn the tortilla on the other side until it finishes frying. 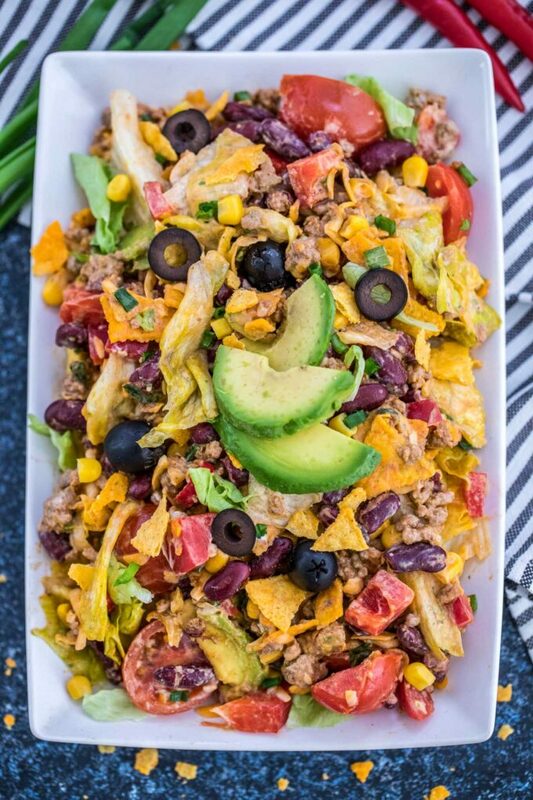 What to serve with taco salad? 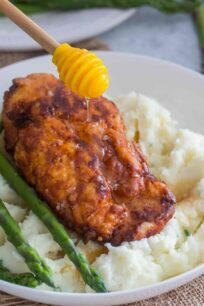 If you are holding a party or a gathering, we recommend serving it with our Fried Chicken Recipe, or the Instant Pot Corn on the Cob. Your friends wouldn’t know where to start with all the sumptuous feast laid out before them! 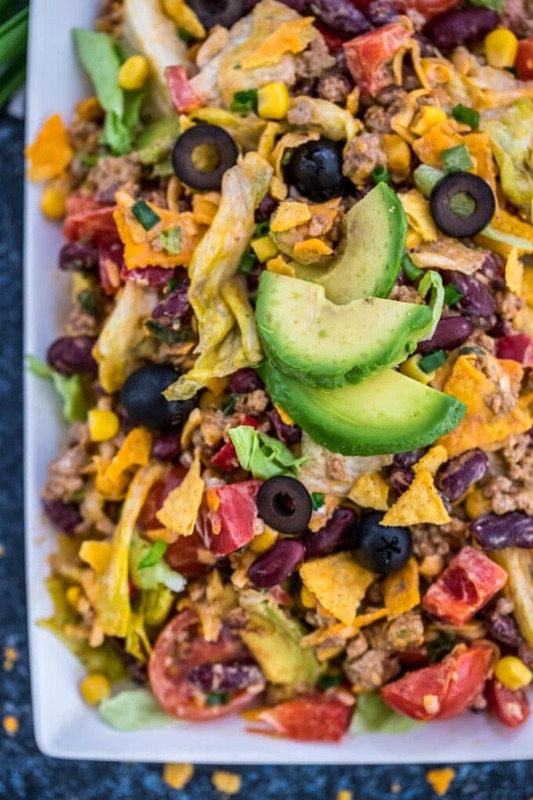 How to layer a taco salad? Whether you’re using bowls or shells, it’s better to start off your salad with the greens first. That way it stays crisp and crunchy. Then add your ground beef. Top with the other vegetables and cheese and drizzle some salad dressing over it. You can make the bowls or shells ahead of time and then store. Just remember, to cool them completely before storing. Also, you can use ground turkey or chicken instead of ground beef. Buy mixed, prewashed salad greens in the grocery to cut down on your prep time. 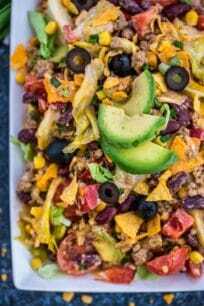 Taco Salad Recipe is the easiest meal to make with just corn chips, beef, vegetables and served with a tangy dressing. It’s crunchy and super flavorful! Place a large skillet over medium heat, once hot add the ground beef. Brown the meat and break into small pieces with a wooden spoon, drain any excess grease. Stir in the taco seasoning and 1/3 cup water. Simmer until the water is absorbed, then remove from heat. In a small bowl, mix the sour cream with the ranch dip mix and chill until ready to serve. Add the chopped lettuce to a large serving bowl. Pour Catalina dressing on top and toss to combine. Top with the taco meat, beans, bell pepper, and sweet corn. Next pile on the crushed chips, tomatoes, green onions, olives, jalapeno, avocado slices, and cheese. Drizzle some of the ranch sour cream mixture and more Catalina dressing. Garnish with crushed chips and serve!